SLMsmart Product kit Comes with one of each of the following 1 Body Cleanse, 1 Crave Control, 1 Calorie Burner, 2 Health Shakes, 1 ProArgi-9 Plus Mixed Berry single serves box also includes System Guide, Weekly Journal, Daily Food Planner and product fact sheet every thing you need to get started. 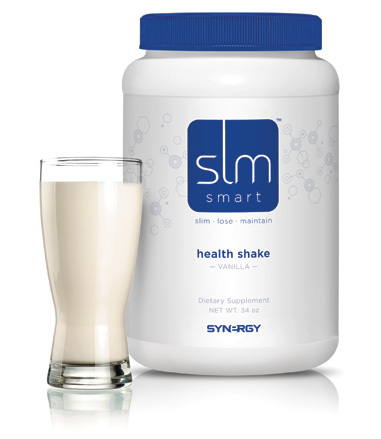 Take control of your weight for good with Synergy SLMsmart. This intelligent, low-glycemic system helps you achieve your ideal weight, no matter the goal—slim a little, lose a lot, or maintain for life. SLMsmart's five-pronged, whole body approach revs up your body's fat burners, cleanses and detoxifies your body, helps optimize blood flow to increase energy and delivery of key nutrients, and helps to curb cravings between meals. Created in partnership with a distinguished doctor of nutrition, SLMsmart embraces a smart calorie mentality. Delivering the ultimate balance of nutrient-rich calories from the right sources of protein, fats, and carbohydrates, this brilliantly effective system ensures your body has everything it needs to look and feel its best. Directions: Mix three (3) rounded scoops into 10 ounces of milk or water. Use to replace up to two meals per day. Turn up the heat with Synergy SLMsmart Calorie Burner. This powerful, thermogenic formula combines green tea with a time-released energy blend. Designed to supercharge your metabolism, Calorie Burner helps your body burn more calories and fat throughout the day. 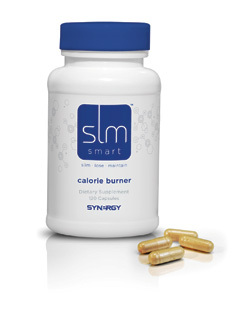 For energizing benefits without unwanted side effects, use SLMsmart Calorie Burner. Directions: Take 2 capsules with a meal, twice daily. Directions: Mix one (1) packet into 14 to 16 ounces of water. Fast track your weight management efforts with Synergy SLMsmart Body Cleanse. Featuring an efficacious blend of 35 time-honored herbs, this powerful formula helps rid the body of waste and unwanted toxins that can build up over time as a result of a poor diet, the environment, or the breakdown of stored body fat. Naturally gentle, Body Cleanse works without interfering with your daily activities. Purify and detoxify your body the easy way with SLMsmart Body Cleanse. Directions: Take two packets daily; one packet with morning meal and one packet with evening meal. To be taken during the first week of each month. Note: Body Cleanse has been formulated to work gently. However combining an effective cleanse with a newly modified, high-fiber diet, may lead to increased bowel movements. If this causes an excessive amount of discomfort or inconvenience, consider reducing your usage to one packet per day. ProArgi-9+ is key in helping the body achieve and maintain optimal weight. L-arginine, the primary ingredient in ProArgi-9+, enhances the body's ability to maintain lean muscle mass and shed fat during weight loss. By increasing lean muscle mass, the body effectively burns more calories. Additionally, L-arginine is metabolized to nitric oxide in the body, a gas that enhances blood flow and assists in the metabolism of fat and glucose. Directions: Mix one (1) packet, or scoop (one serving) with 4 to 8 ounces of water. Stir to dissolve. It is recommended that you take two servings per day. You've committed to take control of your weight, and you've chosen the right system to guide you. SLMsmart focuses on three system components: Essential Foods, high-quality products, and exercise. As you read through this System Guide, you will become familiar with each component and how it relates to your success with SLMsmart. Today is the beginning of your success story – a story that will change your life and impact the lives of those around you. We encourage you to set specific goals, share them with family and friends, and associate with people who will motivate and inspire you. Not long from now, others will begin to notice your transformation. We encourage you to share what you're doing with others and invite them to join you. Your level of commitment to the SLMsmart system will dictate your success. SLMsmart promotes healthy weight loss and following these guidelines can help you lose up to 10-15% of your body weight within the first 90 days. Each SLMsmart product has been formulated with carefully-selected ingredients designed to help you effectively manage your weight. These powerful products, combined with Essential Foods, will supply your body with the nutrients it needs to maintain energy and power through the next 90 days. Again, congratulations for taking the first step towards managing your weight. Your goals are within reach and SLMsmart will be the catalyst to get you there. The body needs fuel. More than that, it needs nutrients. The SLMsmart Essential Foods Plan is a simple system of nutritious eating to follow every day. Doing so will significantly stimulate weight loss and allow you to maintain health and program your body to stay slim. SLMsmart products are designed to curb the appetite, increase the rate at which calories are burned, and serve as meal and snack substitutes. The healthy, revolutionary SLMsmart weight management products work synergistically with the essential foods we eat. The SLMsmart system recommends 30 minutes of exercise, five days a week. Just a little activity is all it takes. You can start with something as simple as walking. Eventually, as your fitness level increases, you may be encouraged to participate in advanced exercises or high intensity sports. How much weight can I expect to lose on Synergy's SLMsmart weight management program? Over the course of 90 days, you can expect to lose at least 10% of your body weight, which is considered a healthy rate for weight loss— optimal for long-term results. Who are the professionals responsible for the SLMsmart system? The SLMsmart System has been headed and formulated by Dr. Stacey Bell. For over 35 years, Dr. Bell has been a leader in the field of nutrition and a registered Dietitian. She received a Doctorate in Nutrition from Boston University, has served on the faculty at Harvard Medical School, has had over 120 papers published on the topic of nutrition, and has given lectures to a variety of audiences across the world. She is dedicated to helping people stay healthy and increase fitness. Dr. Bell worked with the Synergy Medical and Scientific Advisory Board to ensure the quality, potency and nutrition found in the ingredients of all SLMsmart products. She also developed the Essential Foods Plan based on a large amount of data, research and personal experience in the field. How is SLMsmart different from other programs? SLMsmart is unique in that it provides an easy-to-use, satisfying diet plan, a cleansing program, and novel dietary supplements with ingredients that have been shown to produce weight loss. SLMsmart takes the guesswork out of losing weight and relies on the data and experience provided by Dr. Stacey Bell, a member of the Harvard Medical School faculty, who has years of experience conducting nutritional studies and has counseled thousands of patients on how to eat to lose weight and maintain health. Studies have shown that after two years, those who followed many of today's most popular diets (Atkins, the Zone, South Beach) had lost only 2-3% of their starting weight. This means that a 200-pound woman would weigh 197 at the end of two years. This Synergy SLMsmart diet, on the other hand, enables you to lose 10% of your body weight in 90 days, maintain that loss, and lose eventually lose more if you choose to do so. Best of all, this effective system is structured on a healthy, balanced eating plan designed to continuously feed your body the nutrition it needs. How is SLMsmart Body Cleanse unique? Some cleansing routines and products can require people to make dramatic changes to what foods they intake, and are often combined with periods of fasting. Many cleansing routines and products are harsh, leaving people with little choice but to stay close to the restroom. Some cleansing routines are ineffective, containing very little of the ingredients that truly detoxify the body. Synergy's Body Cleanse product contains a more gentle formula that works incredibly well alongside the SLMsmart program. The 35 clinically proven herbs are combined to cleanse and detoxify the body with less shock to the digestive process, and can be taken alongside Essential Foods. When should I take Body Cleanse? For best results, take one packet in the morning with breakfast, and the second in the evening with dinner. Periods of weight loss are the best time to cleanse. During these periods, it is recommended that you take a packet with each morning and evening meal for the first week of every month. In other words, cleanse for the first seven days of every 30 day period. This kind of cycling will ensure effectiveness each time around. Can I take Body Cleanse when I'm not dieting or following the SLMsmart system? Yes, Body Cleanse is safe to use in those situations. However, Body Cleanse makes a bigger impact during times of controlled dieting, when only essential foods are being eaten. To truly see the results of Body Cleanse, we recommend taking it as part of the SLMsmart System. How will Body Cleanse affect my day during periods of use? Though Body Cleanse is built on a foundation of safe, naturally-gentle herbs, cleansing the body may lead to an increase in bowel movements, especially when combined with a high-fiber diet. Best results will be achieved by taking two packets of Body Cleanse per day, but individuals experiencing extreme discomfort or inconvenience may choose to limit themselves to one packet per day within the seven day period. How is SLMsmart Calorie Burner unique? The Calorie Burner formula has been designed and tested to minimize unwanted side effects and safely maximize weight loss. Synergy ensures the quality of all of its products. Each capsule will meet the highest standards of purity and potency. Taking 2 capsules of Calorie Burner twice a day will help your metabolism to function more effectively all day long. An effectively functioning metabolism will speed up the absorption of healthy nutrients taken from essential foods, and reduce delays in the fat burning process. Each capsule contains 75 mg of sustained release caffeine. When taken as directed, Calorie Burner delivers 300 mg of caffeine per day. This would allow someone who already consumes some caffeine in their diet to continue to do so without reaching the levels considered to be risky or questionable. Can I take Calorie Burner at night? It is recommended that you take the Calorie Burner with meals earlier in the day to reduce the risk of sleeplessness. How is SLMsmart Crave Control unique? Crave Control contains the perfect blend of ingredients proven to help you feel full without jeopardizing your health or weight management goals. 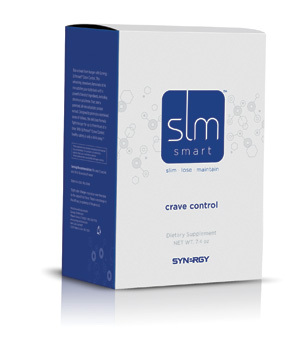 Additionally, SLMsmart Crave Control goes through rigorous quality testing to ensure a pure, safe, powerful product. By replacing unhealthy, unnecessary snacking with a SLMsmart Crave Control, a person can feel satisfied, less hungry, and less likely to crave the foods they don't need. The ingredients of Crave Control provide satiety while allowing optimal function of your metabolism. Chromium picolinate promotes efficient insulin function. Improved insulin efficiency reduces appetite, regulates the fat-production processes in the body, and can prevent excess fat from forming. The potato protein extract in Crave Control triggers the body's natural release of cholecystokinin (CCK), the best-studied satiety factor in the body. The CCK signaling process is a natural one that occurs after food is eaten. The potato extract promotes the release of CCK and extends this natural signal which helps people feel full sooner and longer. The other ingredients, such as stevia leaf extract (a healthy, all-natural sweetener) are designed to make Crave Control taste delicious and mix easily. Can I take SLMsmart Crave Control at night? Taking this product at night does not present a problem at all. There is nothing in the product to make it more or less effective at any time of day, and there are not any side effects (like the sleeplessness risk for Calorie Burner) associated with this product. Slendesta is a stimulant-free, all-natural product derived from potatoes using a water-based, patented process. Slendesta does not artificially stimulate metabolism or cause jitters, bloating, or other side effects commonly associated with some other weight management ingredients. The active component in Slendesta is a natural protein called Proteinase Inhibitor II (PI2). It's a special protein found under the skin of the potato that works by enhancing the body's release of cholecystokinin (CCK), a natural factor used by the body to signal the brain that food has been eaten which helps to create feelings of fullness and satisfaction. I've heard good and bad opinions on soy protein. Why has it been included in this Health Shake? Muscles need a constant supply of amino acids throughout the day to avoid degradation, and this is especially important when calorie intake is reduced. The unique blend of proteins in Health Shake (whey, casein, and soy) release amino acids sequentially into the blood. This not only keeps you feeling full, but also bathes the muscles with a constant supply of amino acids and protein. In this way, muscle mass is better maintained than just taking a single protein like whey protein. Soy protein in this blend and dosage is safe and well tolerated, and actually beneficial for health conscious men and women. Any estrogenic benefits associated with the soy content of Health Shake have not been shown to affect male hormone levels. Men can safely use Health Shake and obtain all the health benefits of soy protein without worry of modulating male hormone levels. Can I replace more than one meal per day with health shake? Yes. Due to its great taste and convenience, you may wish to substitute up to two meals per day with Health Shake. What makes the protein a "time-released blend"? Featuring three protein sources, whey, soy and casein, this blend has been formulated to assure a true time-release that can promote satiety for up to four hours. This also lengthens the duration of protein distribution throughout your system. The amino acids from whey protein appear in the blood almost immediately after consumption. Those from soy protein are next, as soy protein has been shown to be a medium release facilitating longer term distribution of the amino acids. The amino acids from casein appear last. Can you explain the fat and carbohydrate totals in Health Shake? The healthy carbohydrates and fat found in Synergy SLMsmart Health Shake have been specifically added and formulated to allow energy to be released at different time intervals. For carbohydrates, fast-releasing energy has been included in the form of maltodextrin, and slower-releasing energy in the form of fructose. For fat, some comes as fast releasing energy from medium-chain triglycerides and some as slow-releasing energy from sunflower and canola oil. With these time-released sources of energy, you feel satisfied until the next meal, allowing Health Shake to be a true meal replacement.